A little-known Chinese company will become the world's largest company within the next five years. 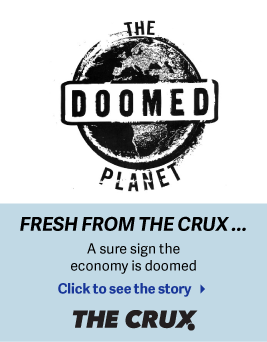 I believe it'll continue to grow at record speed, which is exactly why I predict it'll soon be the world's largest. With more than $250 billion in value, this company is already a global giant. And when a company starts to reach the size of General Electric or Johnson & Johnson, it's easy to assume that the company is getting too big... You might think that its "high growth" era must be coming to an end soon. For example, the company's quarterly earnings report came out last month. Sales were up 52% last year, and earnings were up 47%. That kind of growth is unbelievable... and it likely won't slow down much in the next couple of years. With a growth rate like that, you can see why I expect this little-known Chinese company to become the world's largest company – moving from 10th place to first. What's truly amazing to me is that almost nobody in the U.S. has even heard of this company. But basically everyone I met on my trip to Beijing and Shanghai over the summer can't live without what it does – you can't do business in China without it. You might not have heard of it... But I guarantee that America's biggest names know all about it. Companies like Apple, Google, and Facebook are trying to copy its products as we speak. In the end, I predict this company will come out ahead... It will ultimately be bigger than them all. The company is called Tencent. Tencent's business is owning the screen time of China's population. By "screen time," I don't mean television screens. I mean the screens that the Chinese use for nearly everything – their smartphone screens. This is where folks spend their time. This is where folks read and watch TV. It's their main source of entertainment. And Tencent's commanding control of screen time is why it will grow to be the world's largest company. Take basketball, for example. Thanks in large part to retired NBA star Yao Ming's success, basketball's popularity has exploded in China in recent years. And if you're interested in watching an NBA game, Tencent owns the broadcasting rights throughout China. Tencent runs several social networks, which currently have more than 800 million active users in total. The company also runs a massive payment network with roughly 300 million active users. In short, everything in China revolves around smartphone screens. And no one owns screen time more than Tencent. That simple fact is why Tencent's incredible growth can continue. And it's why I predict it will become the world's largest company within the next five years. China is on Steve's radar for another reason, too... "It will be the biggest story in finance over the next five to seven years... " he writes. "Yet shockingly, NOBODY is talking about it." Get the full story here. Meanwhile, in U.S. stocks, Steve urges readers to reconsider the supposed market top. Read more here: Stop Your Worrying, This Isn't What a Top Feels Like. Regular readers are familiar with the strategy of using "picks and shovels" to make huge gains from sector or commodity booms. This type of company sells needed goods and services to other businesses... much like Levi Strauss did with his iconic jeans during the 1850s gold rush in California. Another example of "picks and shovels" working right now is Cirrus Logic (CRUS). The $3 billion audio chipmaker is cashing in on a major change in the latest version of Apple's iPhone, which no longer includes the traditional headphone jack. 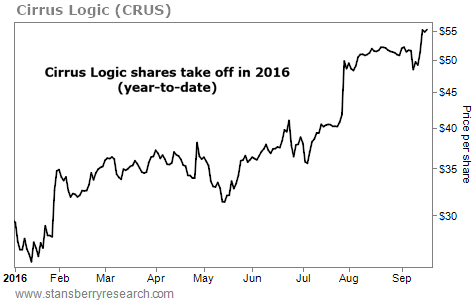 That's great news for Cirrus Logic, whose components are expected to be a big part of the iPhone's new setup. Tencent would have to more than double in price to become the world's largest company. But I think it's going to happen.